Implementing a new industrial thermal fluid heating system in your facility is a big undertaking. From selecting the right industrial heating system to finding a heating equipment manufacturer you can trust and rely on, it can take months – if not years – to choose and move forward with purchasing the equipment you need. But the process doesn’t end once the purchase has been made. In fact, things tend to ramp up once the prospect of implementing a new system becomes a reality. The physical installation of a new industrial heating system is no small feat. For things to go successfully, you’ll want your facility to be well-prepared for a smooth transition from old equipment to new. You’ll also want to be well prepared for the installation phase itself. Here are some key things to keep in mind as you approach the thermal fluid heating equipment installation process. There is no one-size-fits-all approach to preparing for new equipment installation, especially given the variety of facility set-ups that exist, the innumerable system configuration possibilities, and the plethora of industries and processes that utilize industrial heating equipment. That being said, there are a handful of important things to keep in mind as you prepare for the installation of a new heating system in your facility, no matter what type of facility you are managing and what type of equipment is being installed. Before finalizing the purchase of your equipment, you should be sure that the system components will fit within the designated space in your facility. As you prepare for the equipment to be installed, be sure to plan the layout of the new system carefully and strategically. You’ll need to take all system components (including any new elements you may be adding), industry regulations and guidelines, and existing equipment that will be staying in place into account. Additionally, you’ll want to keep safety in mind to ensure that the new system is installed in accordance with all industry safety protocols and is arranged in a way that will protect your employees and your facility should a fire, leak or equipment failure occur. Finally, in terms of layout, consider any issues you may have had with your old system that were caused, in whole or in part, by the layout and configuration. Are there any issues that you can resolve by updating the layout of the new system? If so, take action to make sure these updates are made. As mentioned previously, you’ll want to make sure to keep safety top of mind when planning for the installation. You’ll also want to take safety into account when executing the installation and after the equipment installation has occurred. There is a lot of heavy machinery involved in thermal fluid system installations, so you’ll want to be sure that your facility is set up to minimize the risk of injuries and accidents during the install process. This may mean taking action ahead of time to ensure that specific machinery is shut down and other components within your facility are moved out of the way. System shutdowns can be challenging, but they are necessary when replacing equipment and manageable, especially if you’ve planned ahead for them. When it comes to new thermal fluid heating equipment installation, you’ll have the opportunity to prepare for a plant shutdown. Take advantage of that opportunity so your facility, your employees, and your clients are aware and prepared well in advance. This will help to minimize frustrations – and lost profitability – as a result of the necessary shutdown. Check out our tips for successfully managing a plant shutdown here. 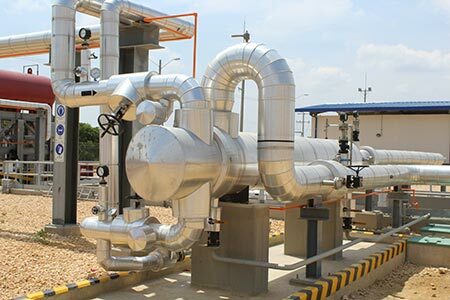 Transparency and effective communication are paramount when it comes to planning for the successful and efficient installation of a new thermal fluid heating system in your facility. In the weeks and months before the install is going to take place, be sure to inform all involved parties, including employees and clients who may be impacted by the installation or the resulting facility shutdown. Keep all necessary parties apprised of updates, changes, or adjustments in terms of expectations and their involvement in the installation. Will employees need additional training to use the new equipment? If so, and if some training can be done ahead of time, it’s a good idea to tackle this before the installation. Build this into the schedule ahead of time so that your team is well prepared to utilize the new thermal fluid heating system as soon as it’s in place and ready to operate. In many cases, additional training may need to take place after the new system is in place. Have a plan and a schedule for this instruction as well so you can tackle it efficiently and be prepared to have your facility operating at full capacity again as soon as possible. Learn more about the benefits of effective plant operator trainings and what they should include here. As the installation date approaches, be sure to stay in touch with the equipment manufacturer to stay on top of any changes or adjustments to the delivery and installation schedule. If you want the install to go smoothly and efficiently, it’s imperative that your facility is adequately prepared. Knowing when to expect delivery will help you to plan accordingly and have all necessary preparations complete when it’s finally time to tackle the implementation of the new system. Need New Thermal Fluid Heating Equipment for Your Facility? We Can Help. At American Heating Company, we have decades of experience helping our customers to design and implement new industrial heating systems in their facilities. With satisfied customers in a wide variety of industries, we are a name you can trust when it comes to high quality heating equipment and customer service that’s second to none. In the market for new heating equipment for your facility? Keep us in mind. We’d be happy to help you upgrade your equipment and coordinate and efficient and painless installation. The Purchase Process: What To Expect When Purchasing Equipment from AHC: Review the step by step process so you know what to expect and take the stress out of purchasing new industrial heating equipment for your facility. 10 Reasons to Choose AHC as an Industrial Heating Equipment Provider: Shopping your options? Find out what sets us apart from the competition. Ready to take the next step? Give us a call today at (973) 777-0100 or contact us through the form below to discuss your facility’s needs and what we can do to help you upgrade. What’s the Difference Between ASME Code and API Code?